With admiring(?) 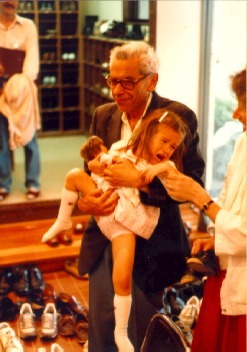 epsilon, and many shoes, Hakone, Japan, 1986. Famous mathematician in background. 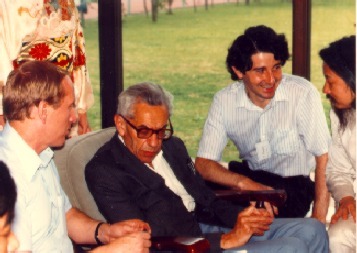 My only photo together with Prof. Erdos. 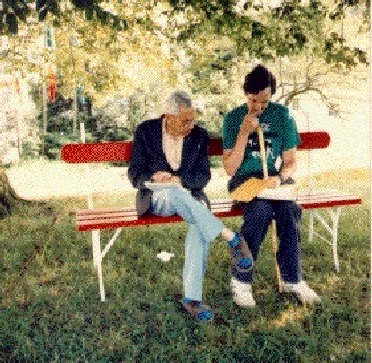 Working hard on a problem at the International Conference on Algebraic Graph Theory in Leibnitz, Austria, 1989. Courtesy of V. C. Ceccherini. My last photo of "Pali-bacsi" (Uncle Paul), taken in July, 1996, near Balatonlelle, Hungary. It was during the banquet of the International Colloquium on Combinatorics and Graph Theory, held on a hill overlooking Lake Balaton, visible in the background. The day's last rays of sunshine highlight Prof. Erdos, as he so often was, deep in thought.